Dr. Katherine High, president Spark Therapeutics, in Philadelphia. Philadelphia drug developer Spark Therapeutics said Monday that the Food and Drug Administration has accepted its biologics license application and granted "priority review" for its lead drug candidate to treat rare inherited blindness. If approved, the treatment would be the first gene therapy for a genetic disease in the United States. Spark's treatment, called voretigene neparvovec, streams genes directly into the eye's retina. It has been granted priority review by the FDA because it treats a medical condition where "no adequate therapy exists," the company said. The time frame for possible approval is about six months, around Jan. 12, 2018. 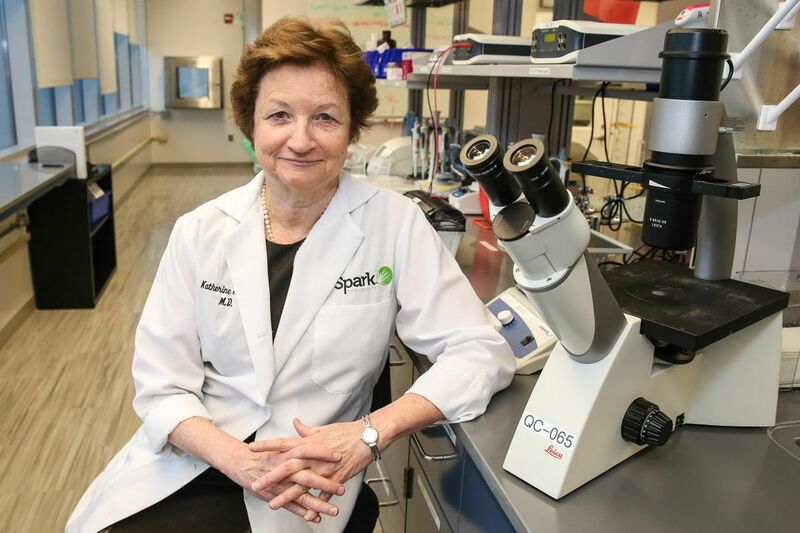 Spark was spun out of Children's Hospital of Philadelphia, based on decades of research led by Katherine A. High, Spark's co-founder, president, and chief scientific officer. "It's really an exciting moment for medicine," said Spark chief executive officer Jeffrey D. Marrazzo, noting that an FDA panel last week reviewed an experimental T-cell immune therapy being developed by Novartis and the University of Pennsylvania to treat acute lymphocytic leukemia. The original study for the CAR-T cell technology was conducted at Children's Hospital of Philadelphia, he said. Spark does not have confirmation, but expects that the FDA may convene an advisory meeting of medical experts in the fall to consider the company's data from three clinical trials, which enrolled 41 participants. In a late-stage Phase 3 study, 93 percent (27 of 29 participants) had vision improvement and "saw restoration of aspects of their functional vision," Marrazzo said. No serious side effects were reported with the gene therapy itself. Two side effects were reported among 41 participants, due to the surgery, which is an injection in the eye. One participant lost visual acuity, or sharpness of vision. A second participant got a bacterial infection in the eye after the injection. Patients in an earlier Phase 1 trial have been followed now for four years and continue to maintain their original vision improvement, he added. About 3,500 patients in the U.S. and five large European markets live with the disease. About half, or 1,750, are in the U.S. Spark's treatment injects particles that are a copy of a normally functioning gene into the back of each eye. Marrazzo said it's too early to set a price. The company hopes the treatment will be a onetime injection, and not a lifetime of treatments, and thus deserves an appropriate payment. "We're doing a lot of work trying to figure out value of this type of treatment, which could be indicated for restoring sight in kids and adults who otherwise are going to progress to complete blindness," Marrazzo said. "We're looking at other rare disease products which are chronically delivered, and what's the value in not having to chronically deliver something for a rare disease." Spark officials have met with health-care payers, including most large commercial health insurers, to discuss the company's clinical data with the goal of "ensuring that patients can have access to the treatment," Marrazzo said. "There's a lot of work still in front of us, but I'm very confident and pleased with where we are today in the process." Spark is also developing treatments for hemophilia A and hemophilia B and for a hereditary retinal degeneration disease, choroideremia, which usually manifests during childhood in males as night blindness and a reduction of visual field. Spark's stock closed up $1.29 on Monday, or 2.17 percent, to $60.65.